Balloon Flower White Platycodon Grandiflorus is one of the easiest perennials to grow from flower seeds. Also known as Chinese Bellflower, the plant grows up to 18 inches tall and features balloon-like flower buds that produce upward-facing, star-like shaped white flowers. The showy, fragrant flowers appear throughout the summer and into early fall attracting hummingbirds, butterflies, and bees. Balloon Flower White is a cottage garden standard. 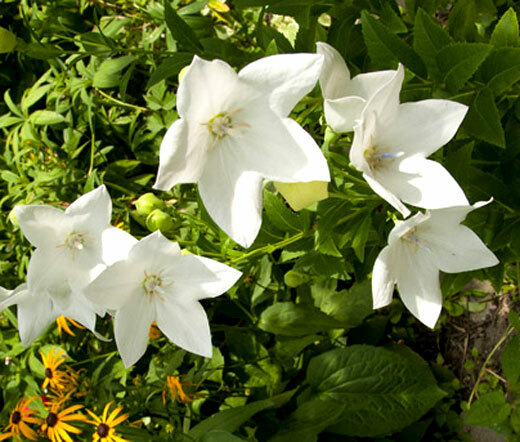 White Chinese Bellflower is a fascinating edging plant that looks incredible in rock gardens and containers. Platycodon Grandiflorus seeds can be planted directly outdoors, and once mature this perennial flower thrives in full sun or light shade preferring well-drained soil. Balloon Flower is drought tolerant and extremely cold hardy. Chinese Bellflower is excellent for cutting and has a long vase-life.